Sheep Grazing on Seaford Head! 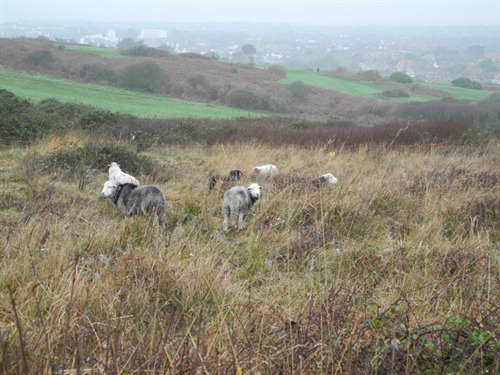 Seaford Town Council and Sussex Wildlife Trust are pleased to confirm the arrival of 20 sheep on the Seaford Head Nature Reserve! They follow in the footsteps of the three cattle who up until recently were grazing another area of the reserve and have made a notable difference to the site. 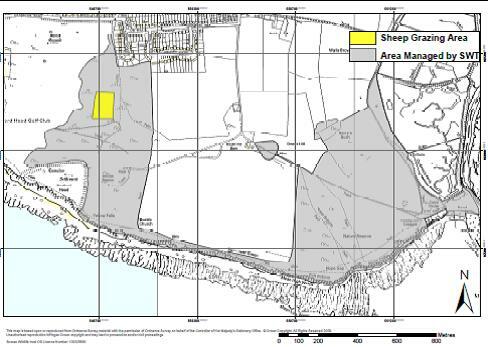 The sheep have been introduced on to the Head as part of the management plan that was commissioned by Seaford Head Local Nature Reserve Committee to provide a guide on the best possible management for the nature reserve over the next five years, 2013 to 2017. The site is degrading due to overgrazing in some areas and a lack of grazing in other areas. Sussex Wildlife Trust took over the management of the 83 hectare site for Seaford Town Council at the beginning of June 2013. Coordinating the conservation work at Seaford Head is the Trust’s Assistant Reserves Officer, Sarah Quantrill. There are 20 Herdwick sheep which will graze the area for a few months to help control the vegetation. There is temporary electric fencing around the area. The sheep are checked regularly. Please report any problems to the Grazier on 07884 496807. All dogs should be kept on a lead in the vicinity of the sheep. Thank you for your co-operation. Anyone wanting more information on the nature reserve or with an interest in joining one of the voluntary groups that currently help care for the reserve and monitoring of the livestock, should in the first instance speak to Sarah Quantrill on 01273 492 630 or 07824 151 935.